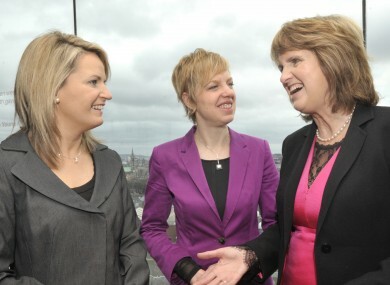 Labour senators Lorraine Higgins and Ivana Bacik, pictured with Joan Burton, are among those who think there should be a fresh abortion referendum. SEVERAL LABOUR TD and Senators have said that a referendum should be held to repeal the 8th Amendment in the wake of a case in which a woman gave birth by c-section after being refused an abortion. The case, one of the first under the new Protection of Life during Pregnancy Act, has raised fresh debate about the controversial constitutional amendment with pro-choice campaigners advocating that the protection afforded in equal measure to both mother and unborn child should be revisited. Politically there is little appetite within government, and particularly Fine Gael, to re-examine the abortion issue after last summer’s fraught passing of the Act, but Labour TDs and Senators have told this website they want a referendum to repeal the 31-year-old amendment. Explainer: What is the 8th Amendment? Wicklow TD Anne Ferris said that she would “most definitely agree” with the need to hold a vote saying she has always been pro-choice. Dublin South-Central TD Eric Byrne said he “of course” believed the amendment should be repealed. His view was echoed by the Waterford TD Ciara Conway. But she added that “it’s very unlikely” to happen under the current government. Junior justice minister Aodhán Ó Riordáin has said the next government must be “brave enough” to call another abortion referendum but has acknowledged that the current coalition does not have the mandate to go beyond the legislation it introduced last year. Education Minister Jan O’Sullivan said yesterday she would be in favour of a referendum, but said it won’t happen in the lifetime of this government. Dublin Mid-West deputy Robert Dowds said that that a referendum to repeal the amendment is inevitable. “It’ll have to happen at some stage,” he said. Meath East TD Dominic Hannigan adopted a more cautious approach saying the matter should be put to the next Labour conference for a decision voted on by party members. “We can have a full and open debate there,” he said. Labour’s Senator and the party’s leader in the upper house, Ivana Bacik, said it had always been her personal view that the amendment should be repealed. She told yesterday’s News at One on RTÉ that the Constitutional Convention should be reconvened in the lifetime of this government to assess the matter. Her colleagues in the Seanad, Lorraine Higgins and Susan O’Keeffe, both said they believed a referendum should be held. Former Labour MEP Emer Costello also said that she agreed with repealing with the amendment. However some dissented from the widely-held view of the party. Labour Senator John Gilroy said he wasn’t sure if repeal is necessary. “I think the Protection of Life During Pregnancy Act worked rather well in balancing rights in this particular case,” he said referring to the case that emerged over the weekend. The Pro Life Campaign has strongly criticised Labour Oireachtas members for support a referendum. It’s deputy chairperson Cora Sherlock said it was “obscene” that they are using the case at the weekend “to whip up support for their agenda”. “The Labour TDs in question should be ashamed of themselves for knowingly introducing a law that wasn’t evidence based and that puts the lives of unborn babies at grave risk,” she said. Read: Why has Labour’s support doubled since May? Email “These Labour TDs and Senators think we should have another abortion referendum ”. Feedback on “These Labour TDs and Senators think we should have another abortion referendum ”.